Wheatgrass, also spelled wheat grass, is a sprouted grass that comes from germinating grains of wheat on trays of soil or hydroponic solution. The green blades are not consumed directly but juiced through a juicer to provide an extremely concentrated form of chlorophyll-rich liquid. Although there is some evidence of it being used by ancient Egyptians for its health enhancing attributes, the initial concept of consuming the grass was introduced in the 1930's by Charles Schnabel, an American agricultural chemist. He discovered that chickens nearly tripled their winter egg laying ratio when only a small amount of the dehydrated cereal grass was added as a dietary supplement. Schnabel's further research proved that most all livestock benefited from wheat grass consumption, producing healthier offspring, richer dairy milk and improved the overall health of these domesticated animals. He later went on to develop green powders that he sold commercially for human intake. Wheatgrass "juicing", however, first originated in the 1960's by living foods educator Dr. Ann Wigmore, who cured herself of colon cancer and advocated its consumption for the therapeutic treatment of many diseases. She believed that to improve general quality of life and recovery from illness one must focus on two underlying factors, one's level of toxemia and one's level of deficiency. Containing most all minerals, many vitamins and amino acids, the juice is a nutritious superfood elixir as well as lymph and liver detoxifier. It is known to energize the body by supplying an instantaneous influx of nutrients to depleted cells and, through the process of detoxification, encourages the release of potential toxic waste accumulation. Fresh pressed juice is a highly charged liquid full of life-force that helps boost the immune system, reduce blood pressure, purify the blood, alleviate gastrointestinal disorders and has been shown to decrease LDL cholesterol levels. Because eating the grass is not appropriate for human consumption, wheatgrass is traditionally juiced. 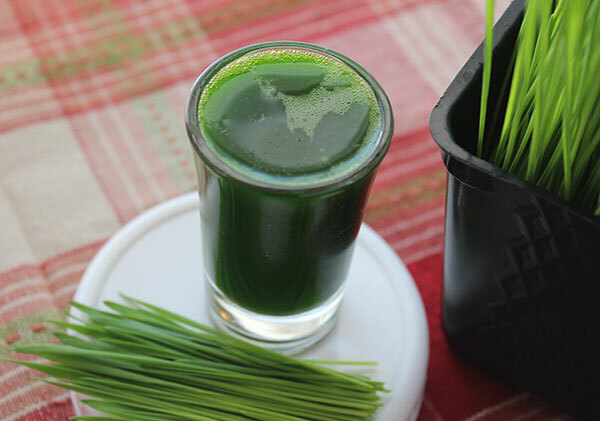 In the 1970's, the term "wheatgrass shots" was coined and became an especially popular way to consume it within health food communities worldwide. 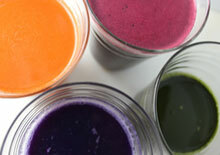 Though it is a rejuvenating drink, the juice is not really a beverage to be enjoyed or sipped on casually. Most people drink it like a shot glass of hard alcohol, quickly and in one big gulp. Not everyone can stomach the juice the first time around as it is quite potent with a thick, green sweet taste and concentrated chlorophyll content that can induce nausea shortly after drinking it. Because of this, many people have an aversion to it and we agree that it may not be an appropriate cleansing method for all individuals. 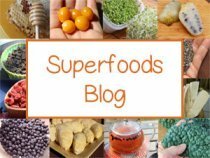 There are plenty of other superfoods, like chlorella or other green juices, that are sometimes a more suitable as well as palatable option. Conversely, numerous health enthusiasts enjoy consuming 1-4 oz glass shots of wheatgrass during periodic juice fasts or detox regimens. 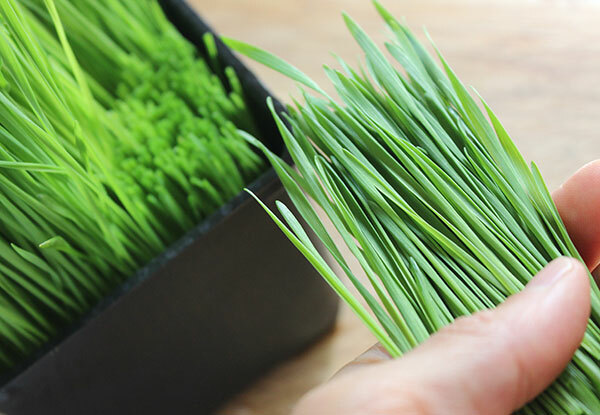 Most people who like the effects of wheatgrass juice don't usually mind the initially intense flavor and aroma that admittedly can smell like freshly mowed lawn. It is most beneficial to drink it first thing in the morning on an empty stomach, but it can also be consumed between meals or throughout the day when juice fasting. 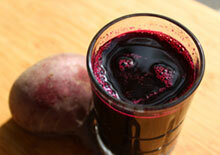 The blades can be juiced with other vegetables, like celery or cucumber, to dilute the strong taste. Because this enzyme revitalizing liquid is immediately absorbed within a 20 minute time frame, drinking it in the morning may help to naturally boost energy levels and make drinking stimulants like coffee less attractive. 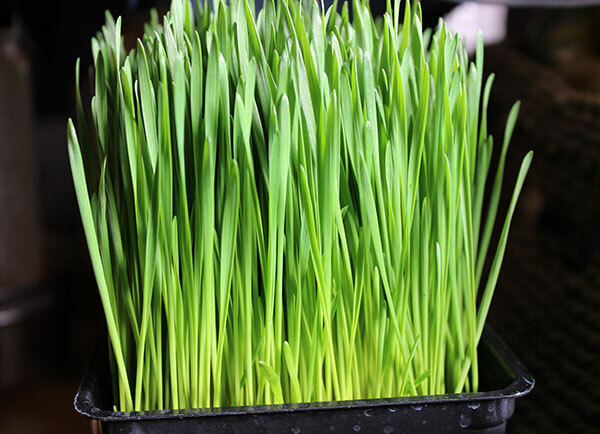 The best wheatgrass to consume is freshly pressed from a tray of hydroponic or soil grown grass and used within 15 minutes to ensure highest nutritional value before nutrients quickly oxidize. 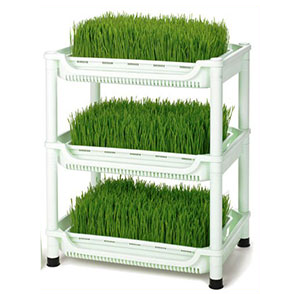 It is frequently sold as trays or flats of grass in health food markets, so it can be snipped right before juicing. This is really the only way to make true wheatgrass juice. It is also available commercially these days as a more convenient to use freeze-dried powder or capsules for those who don't prefer to drink it as a liquid concentrate. These forms are second best to the fresh variety and are made from the juice of the grass, not from the blades themselves. 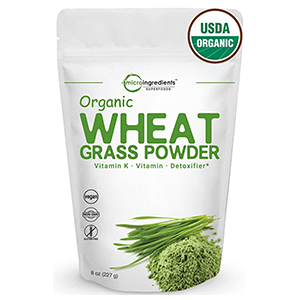 Wheatgrass is essentially the young shoots of the wheat before the stalks develop and produce wheat grains, also called "wheatberries." 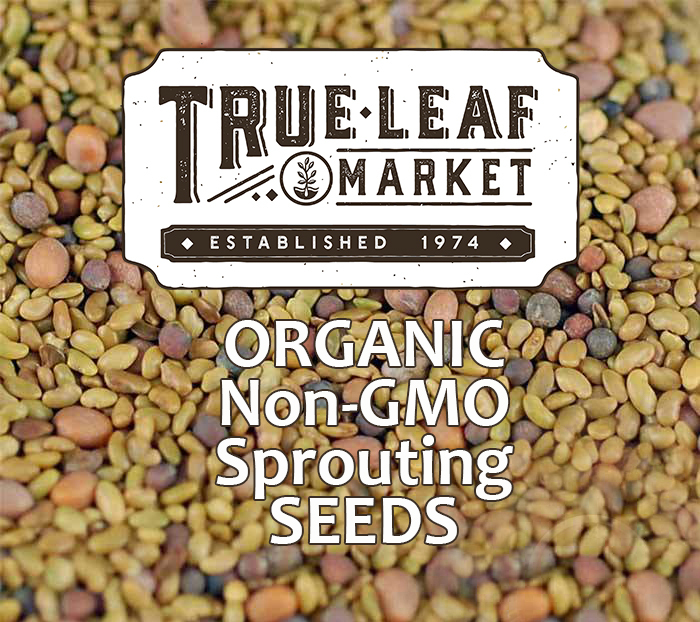 It is typically grown by sprouting hard winter wheat and allowing the wheat to sprout on top of a tray of soil. 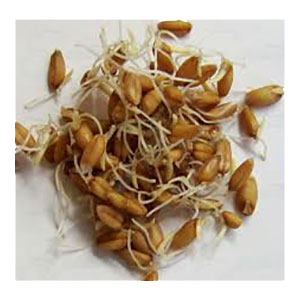 When growing it, you should try to use the hard red winter wheat rather than soft white wheatberries as it will produce sprouts with a higher ratio of protein and amino acids. 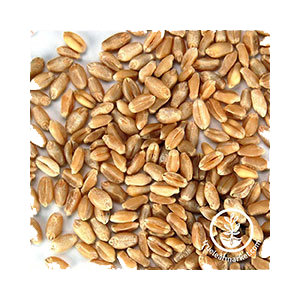 Triticum aestivum is the common wheat species, but other types from the genus Triticum include kamut, spelt or durum. The green grass can additionally be grown using other grains like rye and barley. 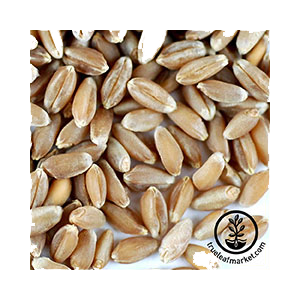 The actual grass from the wheat grain is gluten-free, as all of the gluten content remains in the seed. 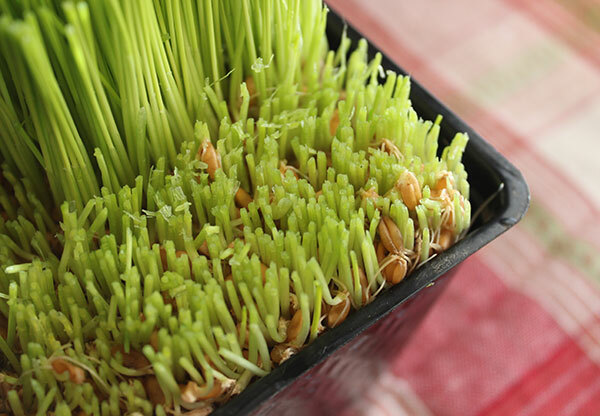 When wheatgrass is harvested it is snipped off at the base, above the grain level. Along with the microalgaes and green leafy vegetable juices, wheatgrass is one of the most chlorophyll rich superfoods around, at about 70% total chlorophyll content. Chlorophyll is the green pigment in plants that collects energy from sunlight and uses that energy for the process of photosynthesis. 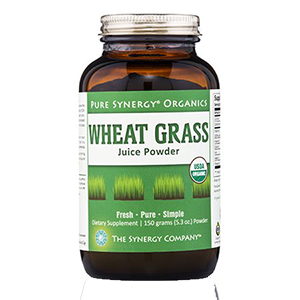 Juicing the grass from wheatberries creates a super concentrated amount of chlorophyll-rich liquid that helps to cleanse the blood, purify the liver, enhance oxygen transport, boost the immune system and increase red blood cell production. It was also claimed by Dr. Ann Wigmore that therapeutic doses of this chlorophyll-rich grass turned her hair from gray back to it's original brown color. Daily wheatgrass juicing for periods of time can help to uplift the mood, alleviate depression and promote increased mental capacities. Some of these effects are not only due to its alkalizing and energizing nutrients, but also chlorophyll's ability to remove and neutralize poisonous substances from the bloodstream and tissues, such as heavy metals, pesticides, plastics and other ingested pollutants. In one study entitled, "Effect of dietary chlorophyll derivatives on mutagenesis and tumor cell growth" results indicated "that food sources that yield chlorophyll derivatives may play a significant role in cancer prevention." All of the microalgaes, like blue green algae, spirulina, chlorella or marine phytoplankton can effectively be mixed into the juice to enhance detoxification properties. Chlorophyll-rich drinks and foods additionally provide protection against exposure to atmospheric radiation or radioactive substances in the environment, helping to lessen the harmful effects of these isotopes. As a cleansing juice, it can be used therapeutically for chronic skin problems like psoriasis, eczema, and acne. The juice from wheat grass is high in antioxidant compounds and is a super condensed source of nutrients, minerals and vitamins. Containing beta-carotene, Vit. C, Vit. E, Vit. 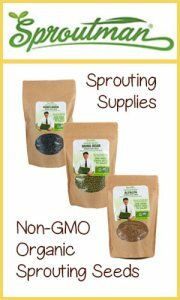 K, iron, calcium, magnesium, amino acids, B vitamins and significant amounts of most all other minerals and vitamins, it is a nutrifying green superfood drink for nutritionally depleted individuals or those with compromised immune functions. 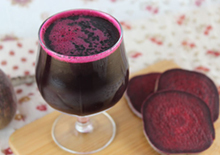 The juice is comprised of 20% protein and is a complete protein source, supplying all necessary amino acids in a bioavailable form easily utilized by the digestive tract. 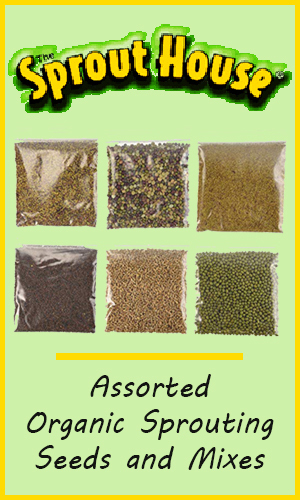 It is also a non-cruciferous green which can be more appropriate for those with an underactive thyroid or hypothyroid. 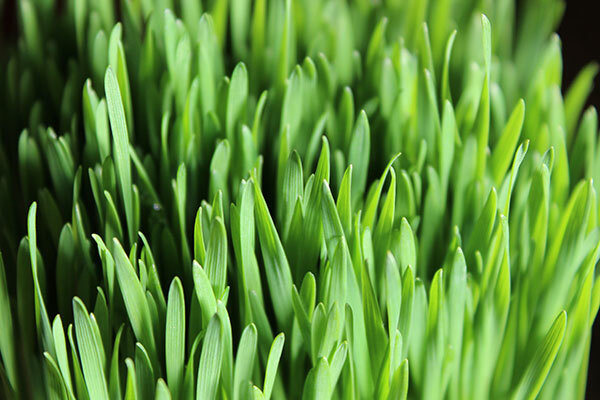 Drinking wheatgrass supports the healthy production of SOD which typically tends to diminish as we grow older. Superoxide dismutase or SOD is an anti-aging nutrient and natural antioxidant enzyme produced within the body and plays a significant role as a free radical scavenger that also protects against DNA damage. In 2014 research studying the affects of wheatgrass on Alzheimer’s patients, it was stated that , "The major finding of this study is that aluminum enhanced oxidative stress. Wheat grass showed a significant improvement in reduction of this oxidative stress by reduction of malondialdehyde levels and enhancement of superoxide dismutase." In the same study it was demonstrated that, "the beneficial effects of wheat grass shows good antioxidant properties, and this remarkable effect of wheat grass may act as a key to treat Alzheimer's disease." In a 2012 study conducted analyzing the effect of wheatgrass on the immune system, it was shown that the juice contains oligosaccharides and other elements that exhibit immunostimulatory actions by directly promoting cell signaling cytokine proteins, which activates immune cells, like NK and T cells. The freshly pressed pure green liquid, and to some degree the extracts and freeze-dried powders, can be a useful adjunct to the diet for treating various gastrointestinal disorders and urinary infections. Periodic consumption of the juice is known to improve bowel function, prevent constipation and additionally helps to cleanse the colon. In a study published in the "Scandinavian Journal of Gastroenterology" it was concluded that wheatgrass appears to be a safe and effective treatment for specific gastrointestinal issues like ulcerative colitis, an inflammatory bowel disease. Wheatberry sprout juice is a natural antibacterial agent helpful for restoring dental hygiene as well as encouraging healthy strong teeth. 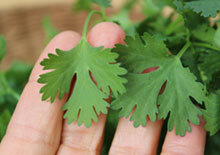 It also assists in the treatment of urinary tract or bladder infections by inhibiting the Escherichia coli bacterium. 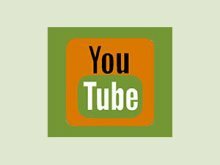 For those of you who love to drink it on a regular basis, growing your own at home is the cheapest way to have all the grass you want for your juicing needs. Wheatgrass is not always available at your local store and its always nice to have fresh living green glowing blades of it growing on your kitchen counter. The method we share below uses a soil-based growing medium that is mixed with worm castings and watered with seaweed solutions. 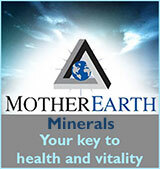 This gives your grass additional minerals that it will love and that you will later consume as nutrients. 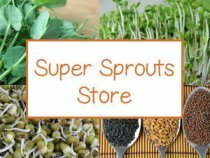 Growing wheatgrass uses the same method as growing other sprouts, like buckwheat sprouts, pea shoots, purslane and sunflower greens. 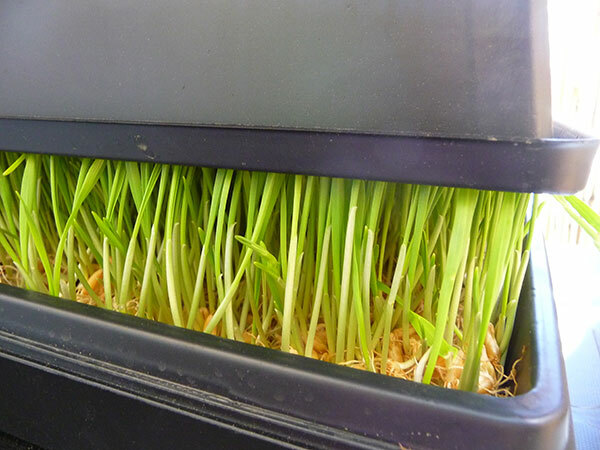 As with any microgreen, you can grow it either on soil or on a hydroponic medium. The process from start to finish usually takes between 8-12 days. 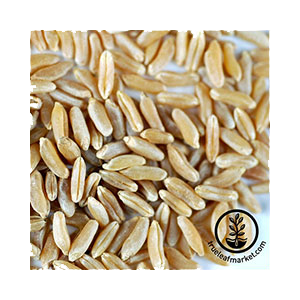 To sprout the grain simply soak 2C of hard wheatberries overnight in a quart-sized wide mouth mason jar of pure water. Place a mesh lid on top and rinse and drain twice daily afterwards draining upside down, for 1-2 days or until white sprouts (1/8-1/4 inches) start to appear. 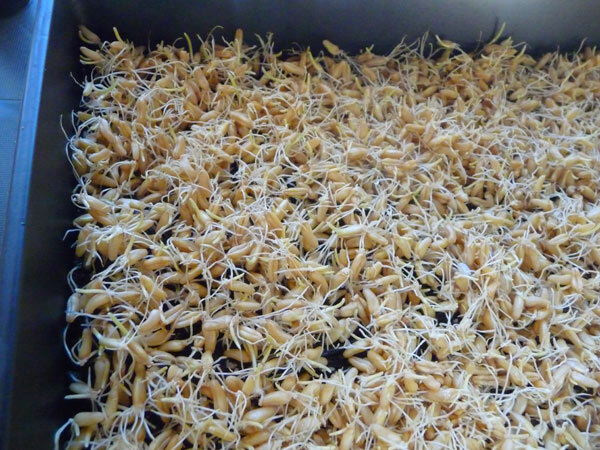 We typically use between 1-2 inches of soil to fill a 10" x 20" sprouting tray for 2C dry grain (that has been sprouted). Generally, the more soil you have the less you will need to water. 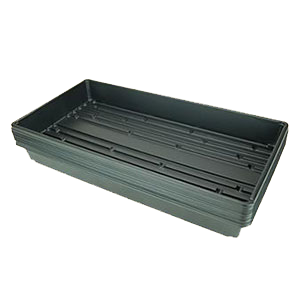 After you place the soil in the tray, press it down lightly and evenly then mist the top with water to thoroughly moisten it. The next step is to take your jar of sprouted wheatberries and place them ON TOP of the soil mix, spreading them out as evenly as you can. Don't worry if they are stacked on top of each other, the roots will find the soil medium below to grow in. Press the seeds down lightly with your hands, mist them well, and place an upside down tray as a lid on top of the bottom tray. When the blades reach the top of the upper lid, this is when you remove the lid and allow them to "green" in indirect sunlight. The wheat grass will be a yellow color at this point but will start to turn green after light exposure. You can put them directly in the sun after one day of indirect light. When the grass is young, a light mist will do fine. As it matures you will need to water the soil in addition to lightly misting it. It is important to make sure they are not too dry but not too moist. You can usually tell this by picking up the tray and feeling the weight of it. When you have a full tray of green grass, usually between 8-12 days you can snip it off for juicing over the next several days. 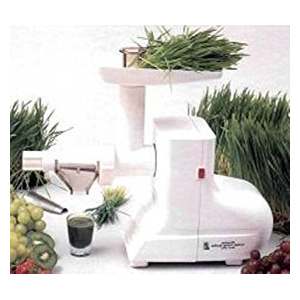 Juicing wheatgrass, because of the thin blades, requires either a manual hand-crank juicer or an electric model specifically designed to juice greens or wheat grass for maximum juicing liquid and nutrient content. 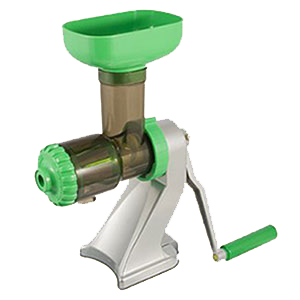 These types of juicers, like the Tribest Green Star, do not oxidize the grass as rapidly as rotating centrifugal juicers. 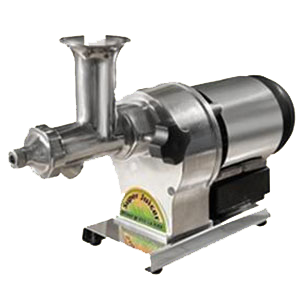 To learn more about wheatgrass juicers and juicers in general see our page on types of juicers. 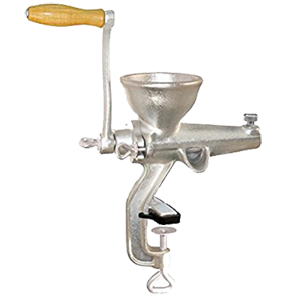 As a cheaper alternative you can also blend the blades with water in a high speed blender and strain out the pulp fiber through a mesh nut milk bag. 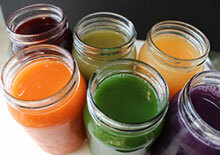 Fresh Juice - This is the freshly cut and pressed juicing liquid. Freeze-Dried Powder - This is commercially created from the juice not the grass itself. 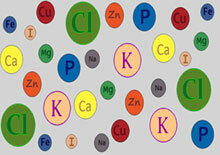 Capsules or Tablets - Encapsulated or compressed freeze-dried powder. Extracts - Typically made from either tincturing the powder or grass in alcohol. 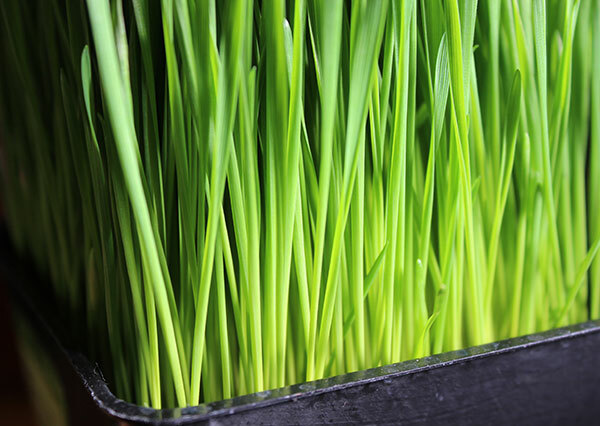 The general rule when consuming wheatgrass juice is that a little bit goes a long way. This is the primary reason why it is served in 1-4 ounce glass sizes. For those new to drinking it, it is good to start with small amounts between 1/2 ounce to 1 ounce at a time to see how it reacts with your particular body type. Sometimes response is dependent on one's current state of health and is something that needs to be considered when using it therapeutically. Some people on a fasting regime might also find that the juice can be very cleansing for the colon when taken as an enema. 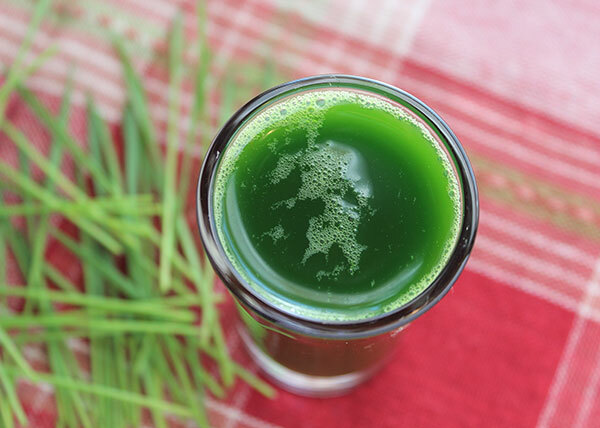 Wheatgrass juice is generally considered safe, however, some people may experience detox reactions that may include nausea, skin eruptions and headaches shortly after drinking it. On rare occasions, some individuals may have serious allergic responses such as swelling of the throat and should avoid ingesting. Others may have allergic reactions when the grass is grown inappropriately and contaminated with bacteria or mold. Seek the advice of your physician if you have major medical conditions before consuming.